I’ve never been to a Russian restaurant before and hadn’t really ever thought about Russian food if i’m being honest. I am however always keen to learn about new cuisines so was very interested when I heard a new Russian restaurant had opened in Manchester with genuine Russian owners/chef and cooking authentic cuisine. St. Petersburg restaurant is situated a short walk from Piccadilly train station, just past Canal Street/’Gay Village’. It shares an entrance with a SPAR shop which is slightly bizarre, the shop being downstairs and the restaurant up. Inside the decor is slightly worn and a bit garish but at the same time quite warm and accommodating. It’s very red and the walls are covered with Russian pictures and artefacts. I have never been to Russia but it looks quite similar to how I’d imagine a restaurant in Russia to look. There is a huge bar in the middle which gives it a bit of a pub vibe. We were seated at a wonky table and considered asking to move until we noticed several other people had the same problem so we didn’t bother. The staff were very attentive and either all Russian or trained in speaking with a Russian accent! It definitely added to the experience. We ordered from the ‘Duke Stroganoff Menu’ rather than the more expensive ‘TSARs A’La Carte’ as I’d heard very mixed reviews about the food and wanted to test it for myself without spending a fortune. I’m more than happy to pay for good food, no matter what it costs but I hate wasting money on bad food. 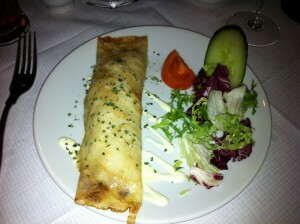 The selection of starters on the Duke menu is fairly limited, 3 soups, a salad and a selection of Blini’s (Russian pancakes). Fortunately I love pancakes, sweet & savoury to I ordered the Ham Blini – ‘Russian pancake stuffed with prime strips of ham & onion sautéed in fresh cream sauce’.My partner ordered Blini’s Gribami – Vegetarian option stuffed with mushroom & onion. They arrived quickly, a little too quickly for my liking actually. Particularly after reading a few reviews that accused the chef of heating food in a microwave (admittedly the reviews were on TripAdviser so it’s best not to take them too seriously). There was no need to worry though, I know microwaved food when I taste it and this wasn’t it. The pancakes were fresh and well cooked and the fillings inside were both tasty, particularly my ham. If I was being overly critical the pancakes themselves could have used a little seasoning but the filling did make up for it. For main course I selected ‘Goulash’ one of the only 2 Russian dishes I have heard of and tasted previously (the other being Stroganov of course). Partly because I wanted to be able to compare my past experiences with an authentically cooked dish but also because it was one of the few dishes that sounded like it would have any sort of spice. I said I wanted to learn about Russian cuisine and what I learnt is that they don’t do heat or spice much. The paprika in Goulash is about as spicy as it gets apparently! 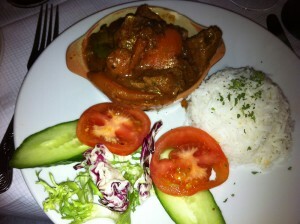 My Goulash arrived looking pretty good, it’s difficult to present a stew nicely but they did a good job. The seriously small portion not so good. It was a well cooked stew, the beef was very tender and it was fairly tasty, personally I think it would be improved massively with a big chilli kick but then I could say that about most dishes and if this is authentic Russian food, who am I to argue with it? The rice was fine if unremarkable. My partner ordered ‘Barantchiky’ which is ‘Russian style juicy Lamb rissoles with spicy sauce’. Similarly to my dish, the meat was cooked well, it was seasoned but had little other flavour added, fortunately lamb is tasty enough for this not to be a problem. The ‘spicy’ sauce wasn’t at all spicy in terms of heat or particularly flavourful but as with my dish it seems like that is how it’s supposed to be. Whilst we were waiting for dessert we heard the ‘entertainment’ warming up. I had heard that they have Russian singers and have even had the Russian State Circus performing there on Friday & Saturday nights. I had hoped to be finished before she started as I’m not really interested in hearing singing like that, even more so when i’m eating. Unfortunately she started just before our desserts arrived. Her first track was bizarrely Disney’s ‘Beauty & The Beast’, i’m obviously just grumpy as almost everybody else seemed to be loving it. Hmmmm. Dessert was a disappointment, mainly because we didn’t receive what we had ordered. We were told that the ‘Russian Gateau of the day’ was chocolate but when it arrived it wasn’t much of a gateau and it certainly didn’t contain any chocolate. It was some sort of apple cake which was quite enjoyable, decent cake with a layer of cooked fresh apple. What wasn’t enjoyable was the hideous strawberry syrup that they’d decorated the plate with (think nasty ice cream van) as well as a large squirt of that horrible pretend cream that comes out of a can. I don’t believe that any decent restaurant should be serving that, if you don’t have any real cream just serve the cake on it’s own, it was much better that way. Something that was much better was the drinks, as well as a fully stocked regular bar they have an extensive selection of Russian beers, wines and more flavours and types of Vodka than you can imagine. I ordered a Russian beer, picked at random as I had no idea what any of them were. It was in a very interesting bottle, very dark and strong but really smooth and tasted good. We also ordered a bottle of Russian wine, I had no idea that Russia even produced wine but I’m glad I do now as it was delicious. 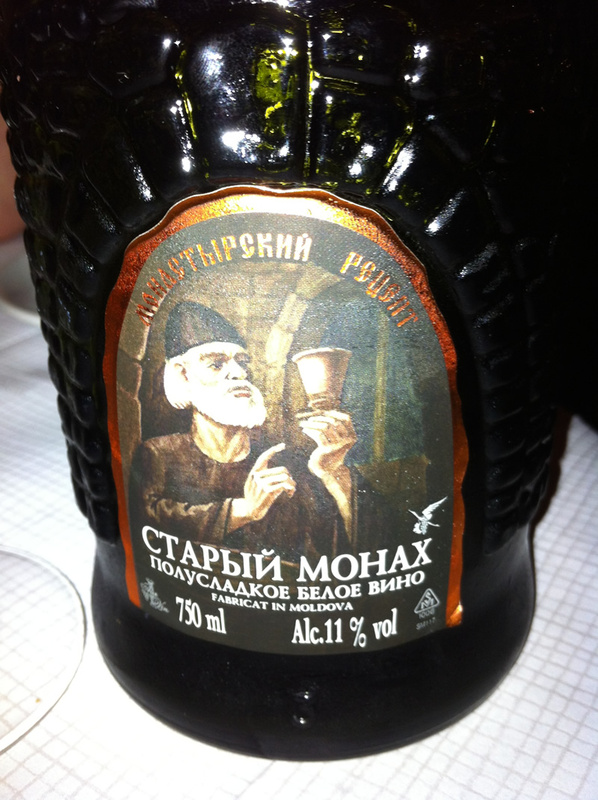 It was supposedly made by Monks in an old monastery! I’ve no idea how true that is but it tasted good and again the bottle was great. So the drinks are fantastic and the food was generally OK, considering some of the reviews I’d read I did have fairly low expectations and it certainly exceeded them. Although the portion sizes are far too small. We left after eating 3 courses and immediately went into Bar 24 and ordered Creme Brulée’s & Chocolate Brownies. It seems that Russian food probably isn’t for me due to the lack of heat & spice so i’m not sure that i’d return on that basis. It’s a nice quirky restaurant though, the staff are really great and there’s a good atmosphere inside (even if I did hate the singing). I’m glad I went though it was definitely an enjoyable experience overall.